In February 1881 Alfred J. Turner was thirteen years old when his father, John Butler Turner, died suddenly at the age of fifty. The family home was in Lambeth, London, where John had been a butcher while Alfred had just completed his first year attending Framlingham College in Suffolk. After his father died he did not return there. At the time his mother, Emma Swaffin Turner (neé Pater), had a three year old daughter, Margaret Winifred Turner, and a baby son, Francis Pater Turner. She also had her late husband's butcher's business to deal with. It seems that Alfred was offered a home by his aunt, his mother's sister Jane, to help relieve the pressure somewhat. Jane and her sister were both natives of the West Country born in Brixham and Jane Swaffin Pater and was now the wife of John (Jack) Hellings, also a native of Brixham but by that time a wholesale fish merchant and fishing smack owner living in Lowestoft. and the tower and spire of St. John's church visible in the background. There has long been an affiliation between those in the fishing industry, of the east coast with those of the West Country. When the herrings run down the North Sea from Scotland all boats would follow them and outside the herring season many of the boats would go mackerel fishing off the coasts of Devon and Cornwall. Alfred went to live with the Hellings in Lowestoft, the town where he was to stay for the rest of his life. Here he learned the fish merchant's trade from his uncle at the height of the boom in Lowestoft's fishing industry and became the outright and sharing owner of several fishing smacks. He married Elizabeth Mary Spatchet on January 13th 1892* and his son, John Pater Turner, was born in October the same year (*the golden anniversary of that date would be more than usually significant in 1942). When his uncle died in 1900 he took over the business at 28 Trawl Market and became a relatively wealthy man by the time he retired in the mid 1920's. 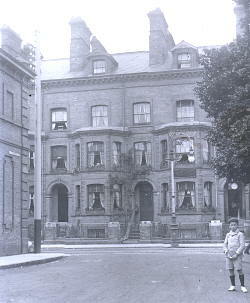 The family had lived at 137 London Road South (where he recorded the bombardment of the town by elements of the German High Seas Fleet) and then in 1917 he bought the fairly substantial Walmer House with its nearly three acres of lawn, tennis court, vegetable garden, orchard and chicken runs. There are references in the text to a number of houses in different parts of the town; these were his pension. By putting his savings into rented property when he was working he had provided for his retirement with the rental income. From the left (standing:) Mr. A. Jenner (Deputy Mayor), Mr. W. R. Robinson, Lt-Cmdr Elson (HMS Liffey), Sir John Field Beale, Brigadier-General Sir Thomas Jackson, Mr. A. J. Turner, Rev. F. W. Emms, Mr. A. Cross, (seated:) Sir Harry Foster, Mr. J. M. Barnard (Mayor), Lord Jellicoe, Lord Somerleyton and Mr. C. Ashton Stray. 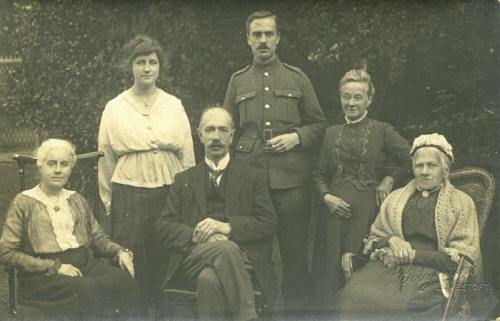 Having served in the Suffolk Yeomanry, known locally as 'the volunteers' (once known as the Duke of York's Own Loyal Suffolk Hussars) he naturally had an interest in the the Lord Kitchener Memorial Home for convalescent ex-servicemen (founded 1919) and was a member of the management team. 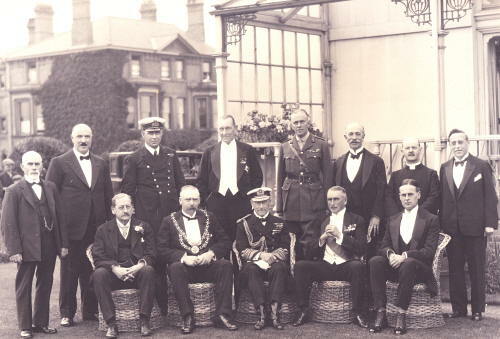 He is pictured here on the occasions of a visit on 8th July 1925 by Admiral Lord Jellicoe (seated centre). He was a keen motorist and had owned a succession of cars since the early days of motoring. 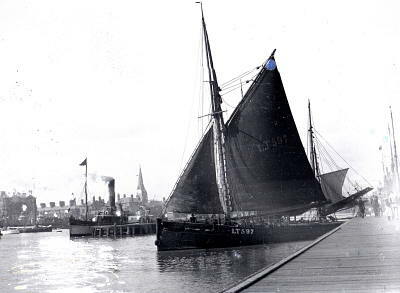 He also owned a sailing cruiser called "Hiawatha" which he kept at Crisp's Creek, Oulton Broad. With such amenities and the gardens and tennis court at his home at Walmer House his grandchildren (and later his great-grandchildren) looked forward to visits during the school holidays. 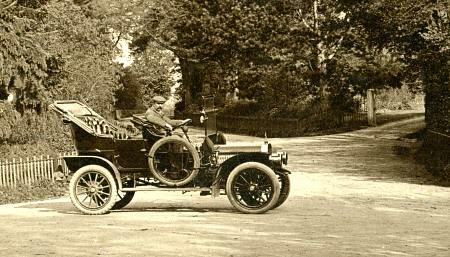 AJT in his 1904 Brush motor car, in the middle of Henstead crossroads. Station every year from his current car number - veracity unproven! The death of his older grandson Keith in early 1945 affected him (and the rest of the family) deeply but he survived until the winter of 1951 when both he and his wife Elizabeth (Lily) died within a few days of each other.